WOOSTER, OHIO–“When College of Wooster Assistant Professor Meagen Pollock stands in front of one of her geology courses, she’s thinking beyond what her students need to accomplish during that class period, or even during that semester. Pollock is constantly thinking about how she can ensure that her students—all her students—develop good research skills.” This is the beginning of an article in the October 2010 AAC&U News, a widely-read publication of the Association of American Colleges & Universities. The topic is Wooster’s signature Independent Study program. Katie Holt of the Wooster’s Department of History is also featured. We are very proud of our colleagues … and just love the fact that one of our geology students in the field is pictured as an example! 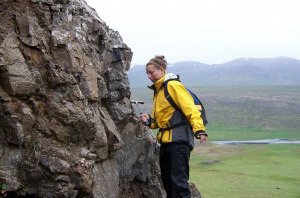 Ali Drushal Sloan ('09) doing Independent Study fieldwork in northern Iceland.